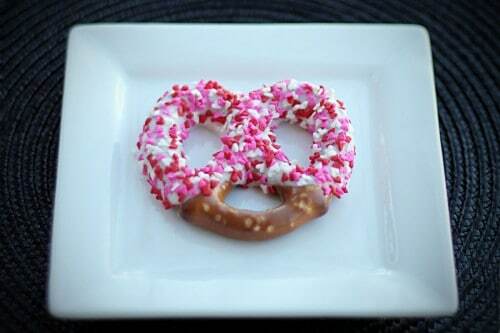 If there is one thing that you can depend on me making for every holiday and special occasion, it’s chocolate covered pretzels. Everyone loves them (and now kind of expects them), they are pretty, they are tasty, but the best part is they are SO EASY. 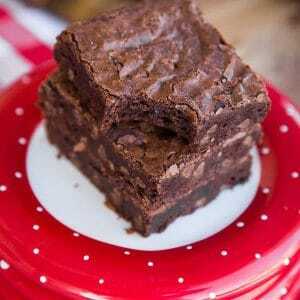 People think I’m some chocolate whiz to be able to make these, but seriously, they are on of the easiest things to make. 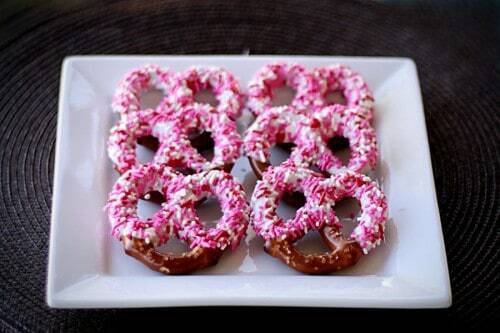 Pretzels. Chocolate. Sprinkles. 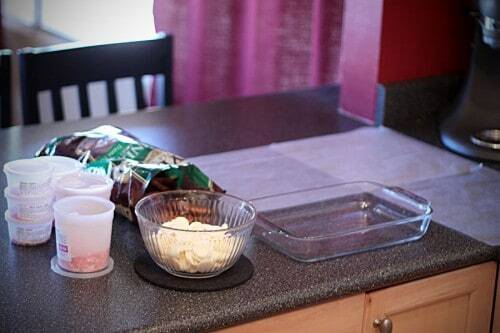 You can also use things like M&M’s or mini chocolate chips to decorate with. That’s about it. I prefer the Snyder’s Olde Tyme Pretzels. Sometimes I do the rod pretzels, but usually it’s the Old Tyme. 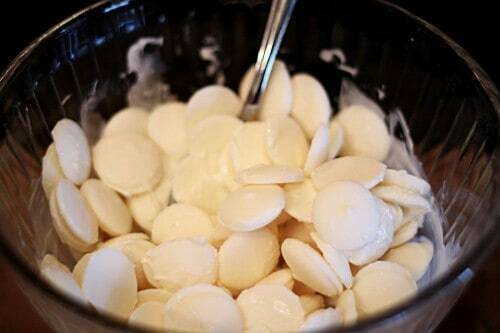 I usually use Wilton Candy Melts, but am not terribly picky when it comes to the white chocolate/almond bark. For regular chocolate, I do prefer to either get the Wilton Dark Chocolate Melts or the chocolate from my local baking supply company. 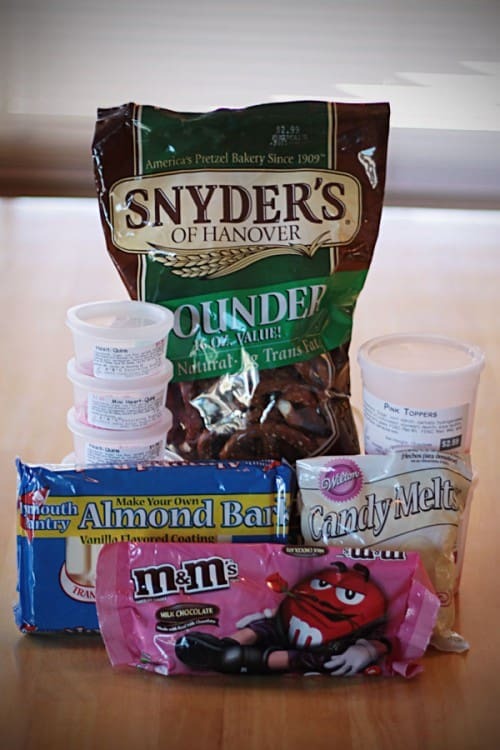 I have my pretzels open and ready, my sprinkles open and ready, a pan to sprinkle over and plenty of wax paper to sit the pretzels on after they take a dip in the glorious chocolate. Than I return them to the microwave for another 30 seconds at 50% power. I usually stir it really well, than go for one more spin in the micro. 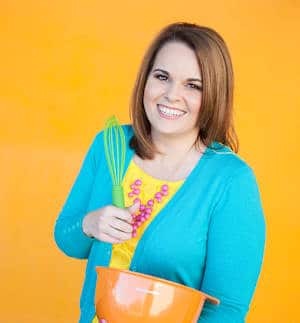 I wish these photos were a bit better (I’ve got NOTHING on Ree Drummond and her Pioneer Woman photographic magic – let’s just say that). 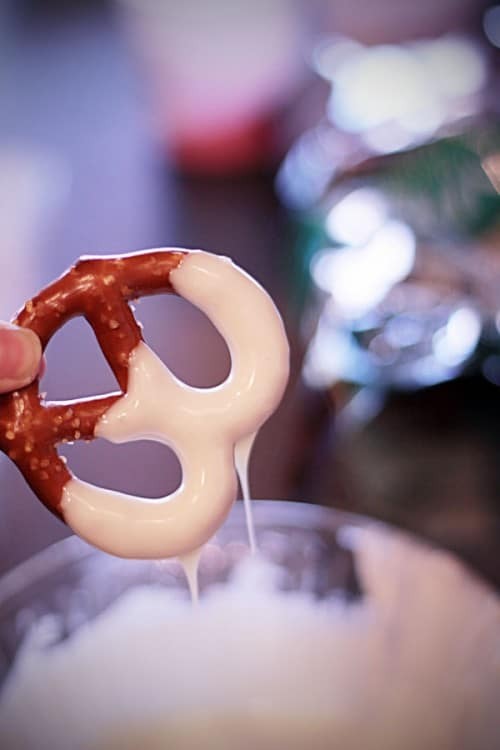 You will want to dip the pretzel into the yummy creamy chocolate…. You will likely get some chocolate on your hands. I consider this a bonus. I gently tap the pretzel against the side of the bowl, before holding it over my sprinkle area. I always hold my pretzel, but you could also sit it down (probably on wax paper) as I did here. For photo purposes I had to lay the pretzel down, or grow a third arm, and laying the pretzel down just seemed like a quicker option. 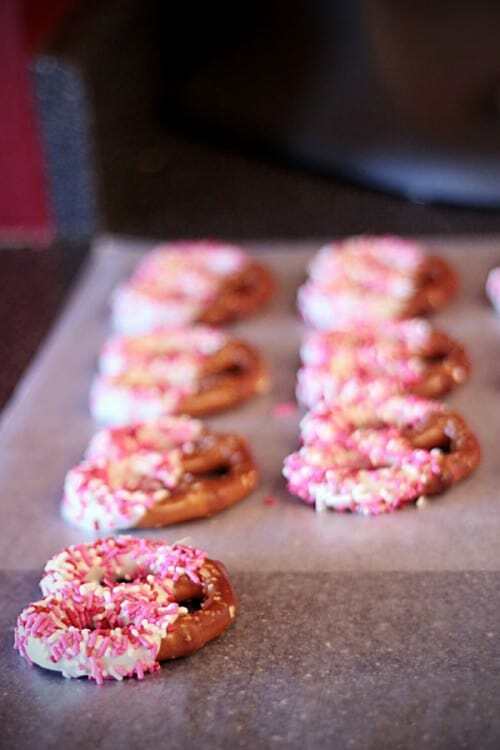 If I’m making my pretzels for kids, which is often the case, I tend to go heavy with the sprinkles, because otherwise they all fight over whichever pretzel appeared to hit the sprinkle jackpot. Most adults tend to like a few less sprinkles (and I personally prefer the crystal sugar sprinkles). 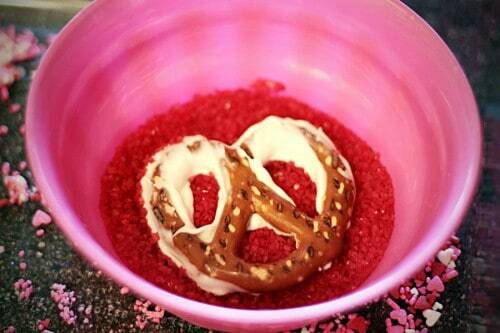 When using the sugar sprinkles, you can dip the entire pretzel into a bowl of sprinkles. I find this works best when the chocolate has cooled and thickened a bit. If the chocolate is hot and runny, you will literally have a hot mess. A yummy hot mess you can clean up with a spoon, but it does slow down the process. 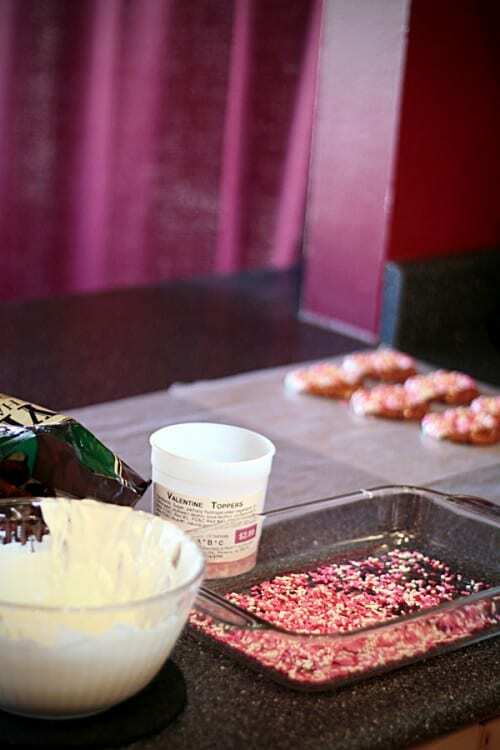 Than simply sit them on the wax paper, pretty sprinkle side up, and let them set up. I usually do not put mine in the fridge to set up, unless it’s 7:15am and I’m making pretzels at the VERY last minute for my daughter to take to school. Which sadly happens. Too often. 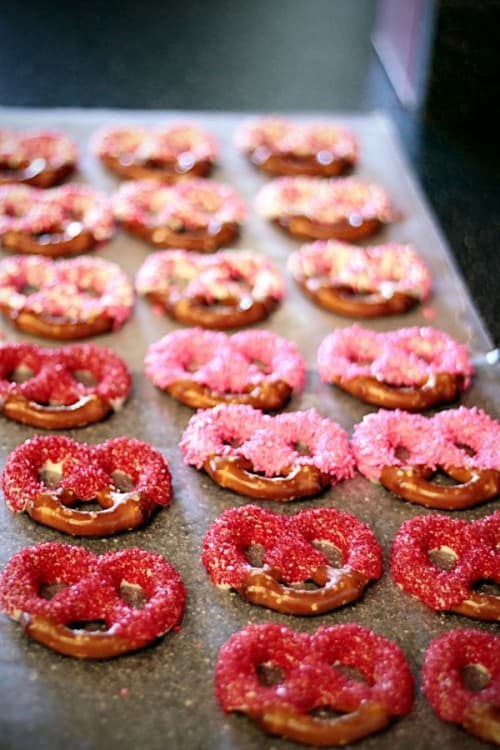 Look at all the pretty pretzels! I usually package them up, two per package with cute little toppers, to give out. I will do a post on how I do those next week (though I am hardly original, there are a ton of cute toppers out there). And there you go! You have darling & delicious chocolate covered pretzels to give away (or eat later that night, I’ve tried both options, and either one works well). Sugary. Salty. Sweet. Enjoy & Eat! What a wonderful, hassle free treat for valentine. That is just amazing. Must make it. Adorable! I love the sprinkles. Chocolate melts at body temperature, so depending on the type of chocolate you used, the temperature it is (were they in the fridge? Room temp? Is the room 65 degrees or 78 degrees?) and your own temperature, the chocolate can certainly soften in hand. 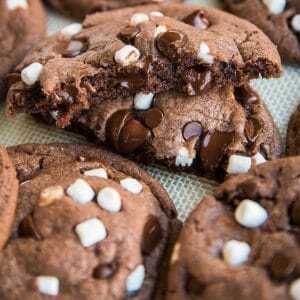 I do prefer to use the chocolate wafers to chocolate chips for this as they seem to stand up to temperature better. 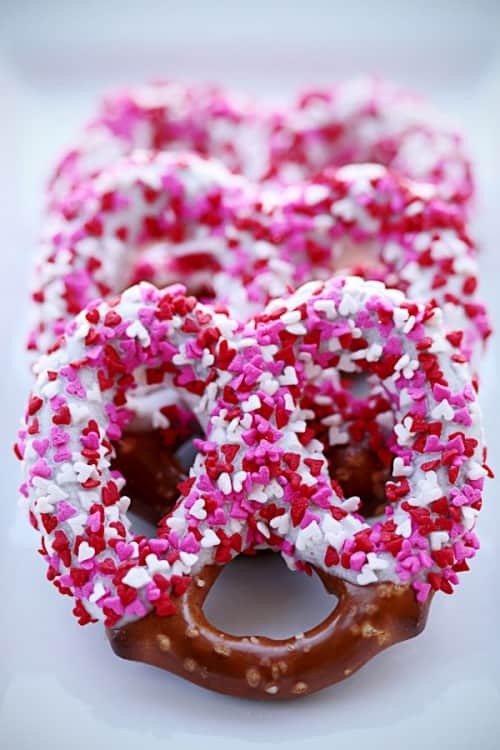 These are so pretty, we are just planning our Valentine’s gift bags for the kids at school, these are way better idea than the same old heart shape cookies. A couple per bag, kids are going to love them. Thanks so much. 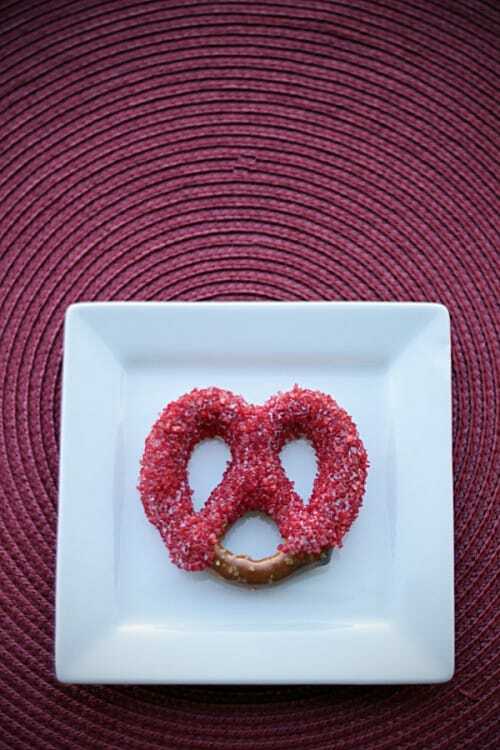 I love how your pretzels look like they are wearing “masquerade ball” masks when you dip them like this!! Just made halloween ones. Your directions couldn’t be better! Thanks so much! Great, thanks so much Dana – so glad they were helpful for you! I’ve always been nervous to do this, but I will definetly be trying now! 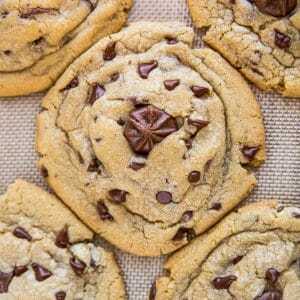 What do you do with any leftover chocolate? 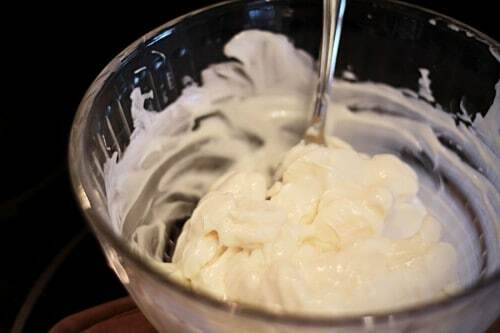 Can you keep it in the fridge for a few days? 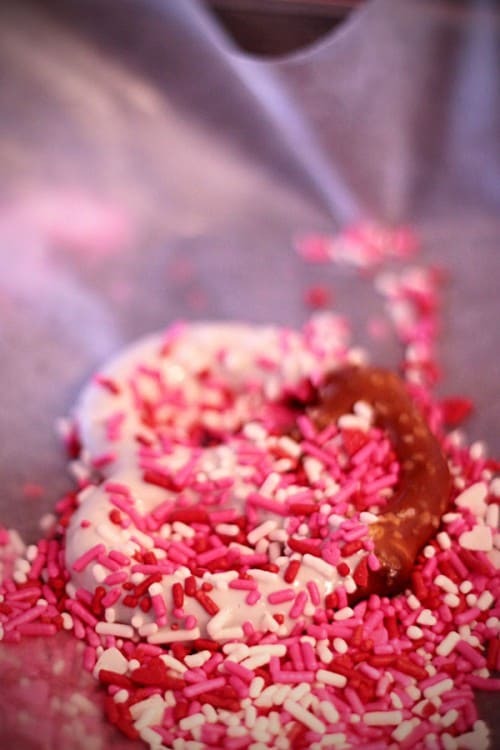 Would you share where you got the tiny heart sprinkles? I LOVE them and have tried to find them before. Thanks, If you don’t wanna share, it’s ohkay I understand! so cute, totally making these, thanks for the show how! So pretty! My girls will LOVE them. Thanks! 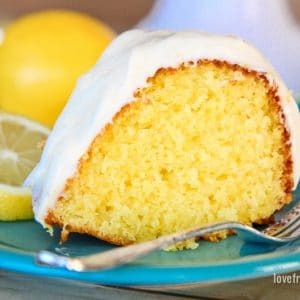 ohmygosh, I just found you from Pinterest and these look fabulous!! 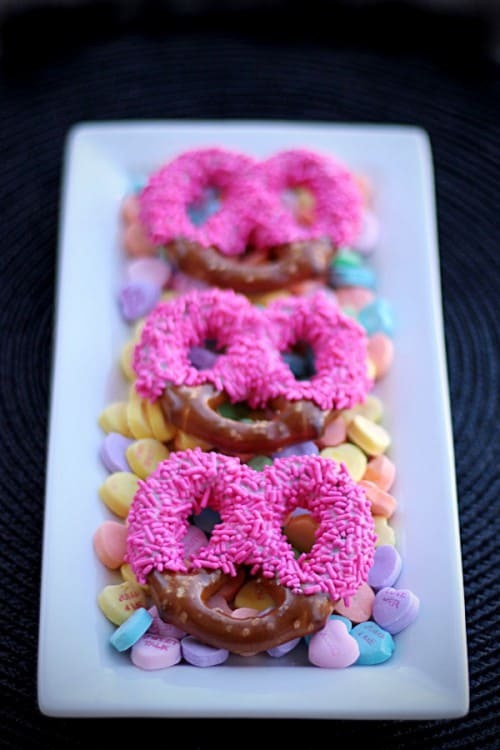 I've covered lotsa pretzels with chocolate in my time, but never had the creative foresight to see the pretzel knots as pretzel hearts… I must have been sleeping. These are great! Your pretzels turned out great!! I found your post from Pinterest. 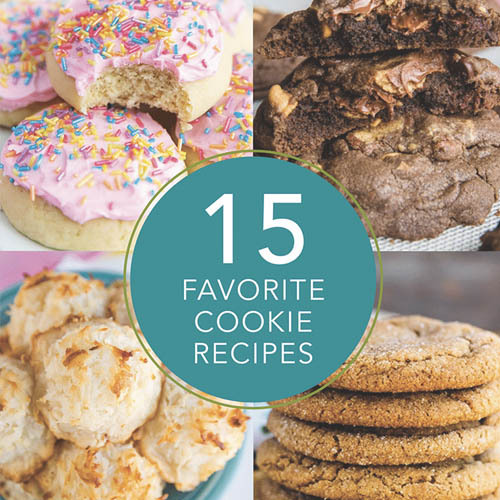 I made some too and added a link to you on my blog post this evening! Thank you so much! I will be making them this afternoon for a little girls party tomorrow. I was just wondering how long they’d last. Congratulations! 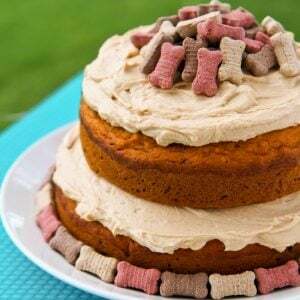 We wanted to inform you that this post has been selected as the Archive Featured Post of the week on Food Frenzy. Thank you! Made for my sons kindergarten class and they were a hit! Came out just like pictures! Was so happy! Can’t wait to make more for St. Patrick’s day! So glad I stumbled across your website…you have such beautiful ideas! 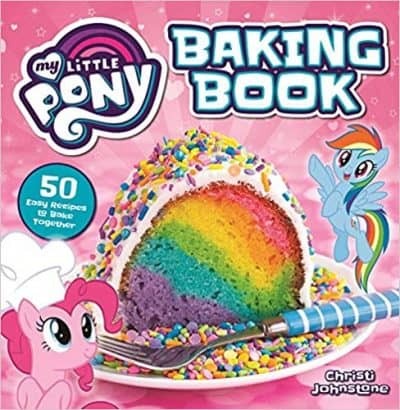 Want to make everything! Congratulations! 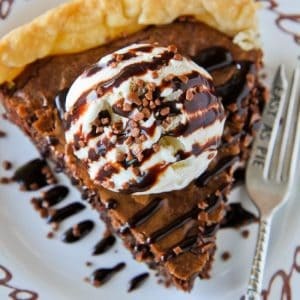 This post was one of the top 5 viewed posts on Food Frenzy for February 2012. Super easy and super cute. Who wouldn’t love these? 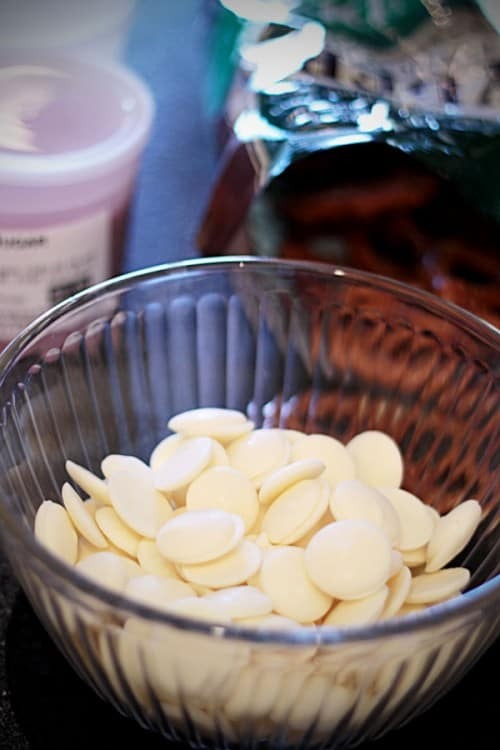 how long will these chocolate covered pretzels’ keep once made? Storage recommendation? 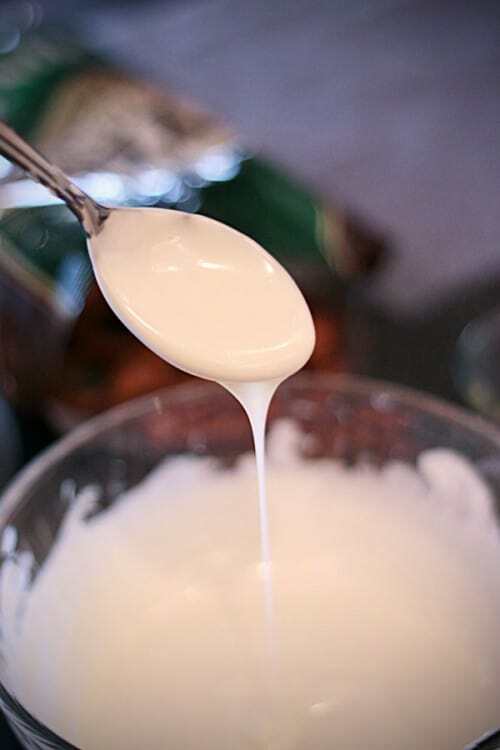 Lori, I typically make them within a day or two of needing them (they are so quick you can whip them out pretty quick even at the last minute). For storage, if I’m going to be giving them as “favors”, then I place them each in an individual food safe cellophane bag and seal it. If I’m doing them for a group, I’ll gently place them all into a very large tupperware type container and put a lid on it. 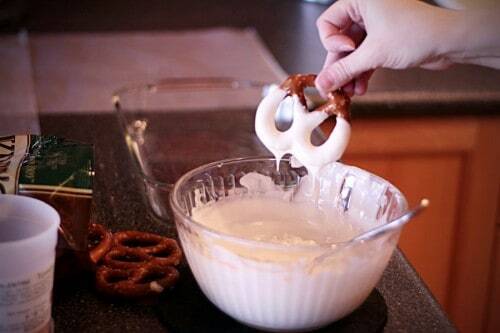 They are probably fine for up to a week, but the pretzels can start to get soft, especially if the area is humid. 2-3 days is probably ideal. I LOVE them they are the cutest and yummy! Grandkids LOVE them! Thank you ?